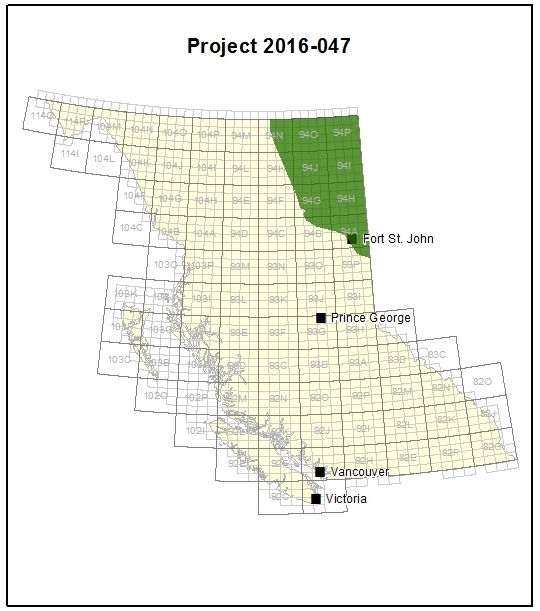 This project evaluates four favourable areas for potential geothermal development in northeastern British Columbia: Horn River, Clarke Lake, Prophet River and Jedney. Geothermal resources may play a significant role in the long-term energy strategy for BC as we transition to alternative energy sources to generate electricity and heat. However, a major barrier to geothermal development is its high level of uncertainty in terms of cost and available resource. assessed the capital costs of developing geothermal power plants by calculating industry-standard key financial indicators. The results from this project build on previous geothermal research in the project area to improve our understanding of the investment required for geothermal exploration and development in northeastern BC along with potential levelized costs of electricity. The area of investigation is in northeastern British Columbia. It extends east of the Rocky Mountains to BC’s border with Alberta and north of Fort St John to the border with the Northwest Territories. The underlying geology is the BC portion of the Western Canada Sedimentary Basin (WCSB). The researchers created a geothermal favourability map of northeastern BC. In conjunction with geological and economic criteria, they used the map to select four favourable sites: Horn River, Clarke Lake, Prophet River and Jedney. For each site, researchers used the area of known gas pools to estimate geothermal reservoir areas and to estimate power plant sizes (‘proxy power plants’). From this, the amount of available electric power (in megawatts, MW) that could be generated was estimated based on variables such as volume, flow rates, and salinity. Levelized Cost of Energy (LCOE): the cost at which electricity is produced throughout the lifetime of the project. Any power plant technology can be compared via LCOE. Net Present Value (NPV): the difference between all discounted costs and revenues. Comparing the NPV of different projects helps establish which has greater financial returns. Internal Rate of Return (IRR): equal to the discount rate at which the NPV becomes zero.